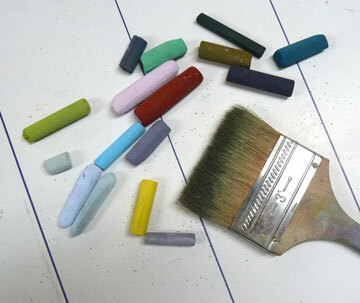 It's end-of-year cleanup in my studio. 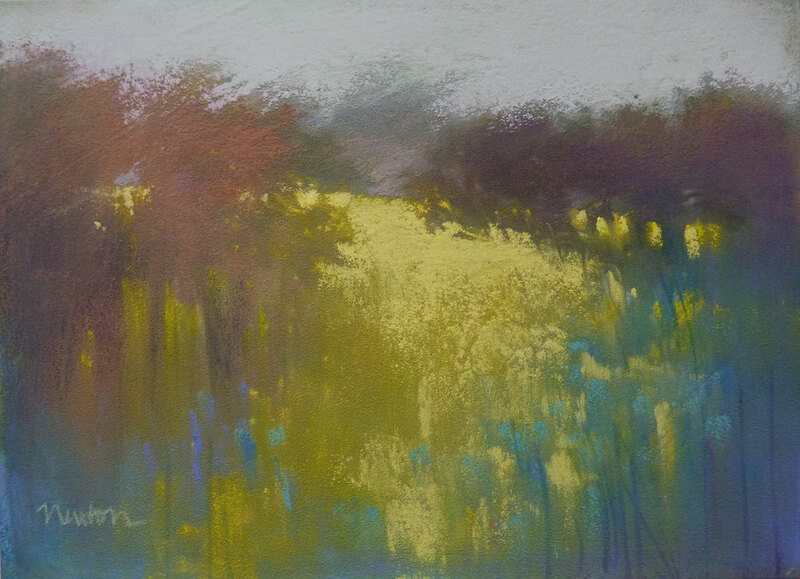 I'm looking for new homes for some of my smaller, unframed works. This one, "Meadow Lights" can be purchased on Daily Paintworks. As we approach the winter holiday season and gray weather, it is comforting to remember sunlight and how it can put a song in our heart. I'm already looking forward to spring. This painting is for sale on my DPW Gallery (see the link in the upper right corner of this blog) and I have just added PayPal to make purchases easier. 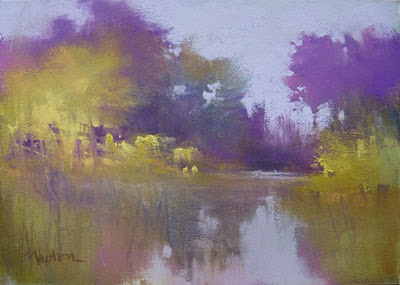 This may be my last painting of 2011. Merry Christmas and Happy New Year to all! award at 6" Squared Show! 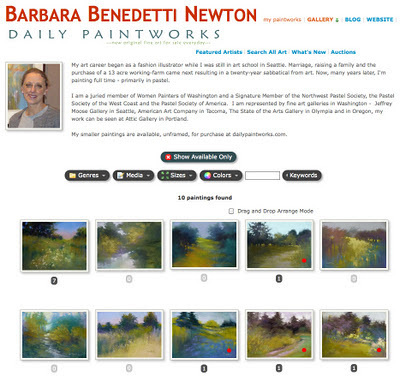 212 artists, 542 beautiful paintings! 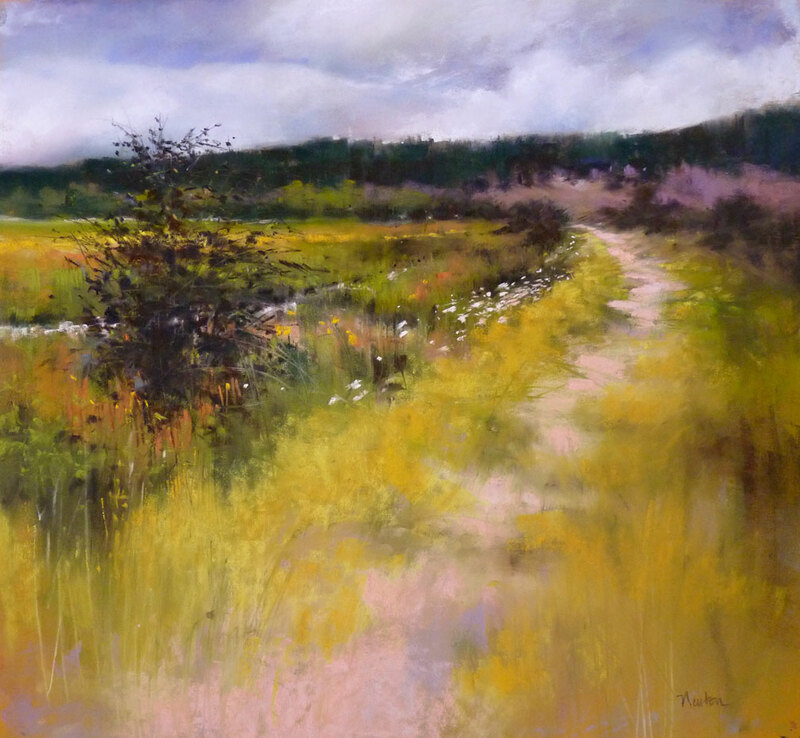 I was happy just to be included in this show but to have "Northwest Meadow" receive one of the $100 Gallery Awards in those odds is amazing. My thanks to Randy Higbee and the Randy Higbee Gallery staff and to juror Jean Stern, Director of the Irvine Museum. 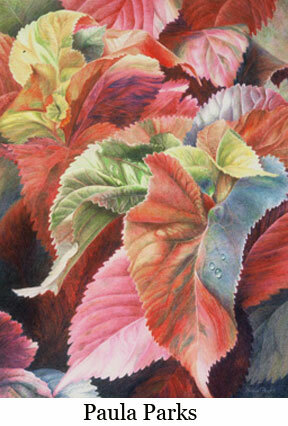 Fanciful is about color play and pushing colors just beyond believable for a whimsical view of the world. 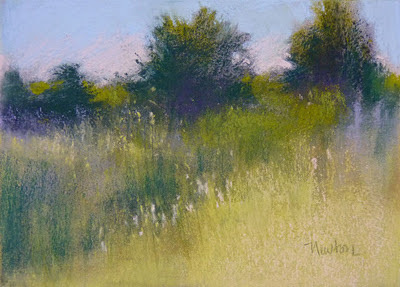 It is another of the 5x7 pastels for my Daily Paintworks gallery. 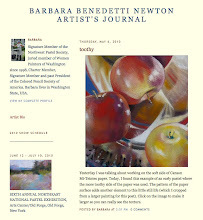 About a month ago I joined Daily Paintworks and to date I have posted 10 paintings. What fun! My thanks to all who have commented, encouraged and purchased paintings! I have learned a lot and have made plans to change a few things next year. Price: While I was getting to know my way around DPW, I have priced my paintings at $1.00 per square inch as my "experiment" price. That is far less than the amount the same painting would sell for in one of my galleries. Beginning January 1, 2012, painting prices will increase. Shipping: I have shipped sold paintings in a USPS Priority Mail flat rate box - not the cheapest way to ship but paintings have arrived safe and sound. I will continue to ship this way but beginning January 1, shipping will be FREE within the US. Medium: Pastel has been my primary medium for the past 9 years. 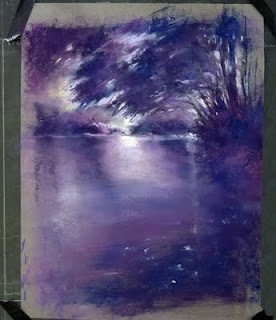 If you have been following this blog, you know that I just started playing in oil (again) and am excited to continue. 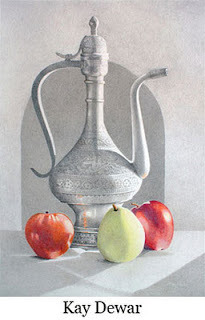 I hope to add oil paintings to my DPW Gallery. Once again, thanks to all who have taken time to view my work and the work of the other fine artists at Daily Paintworks! Good news today! I learned that my paintings "Cedar River" and "Summer Evening" have been accepted into the International Association of Pastel Societies (IAPS) 2011 Web Show. Yay! This was so fun, wheee! 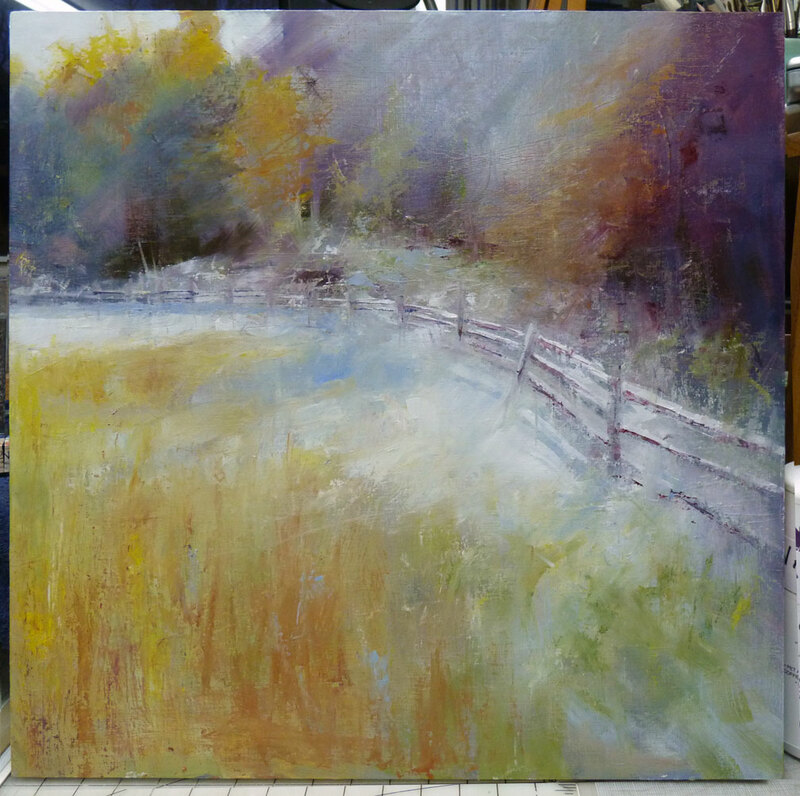 This is step 2 of Morning Frost Line (20 x 20 inches, oil on wood panel). I'm working on value. 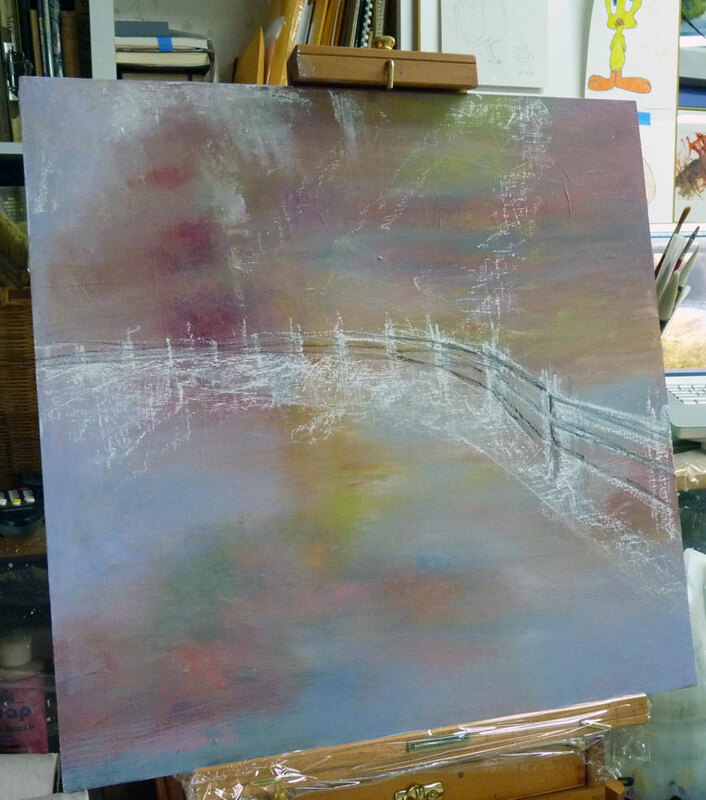 As you know, I am relatively new to oil paint and I have no idea how many "steps" there are in a painting. Lots of palette knife work and I love that random, spontaneous look. In moving from colored pencil years ago to pastel, it was the looser look that appealed to me. Maybe I am making another jump from pastel to palette knife? Click on the image to enlarge. I have it on my phone as wallpaper and by the time I'm done with this experiment, I might decide it was one of those lovely reference photos that was better left as just that - a photo. I found my old box of oil pastels and began with a sketch on a previously painted panel. Later the same day...I just had the most fun painting that I have had in a long time. 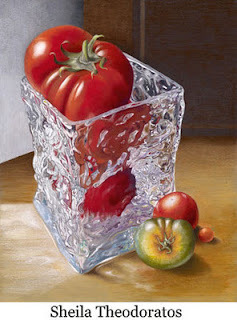 Here is the first step of Morning Frost Line in oil. More tomorrow. 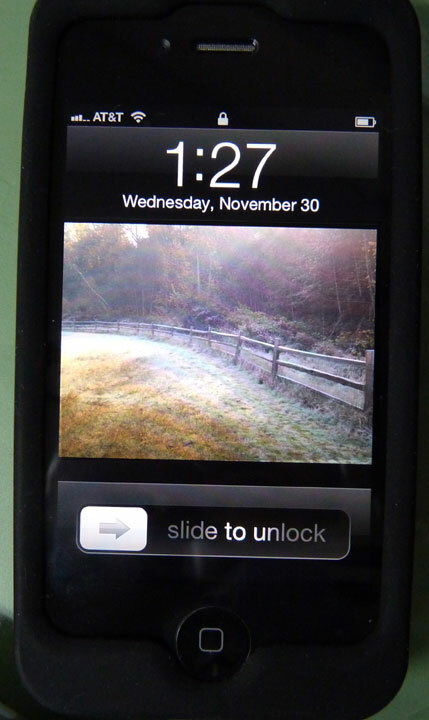 This is a scene of our off-leash dog park, early morning before the frost melted. 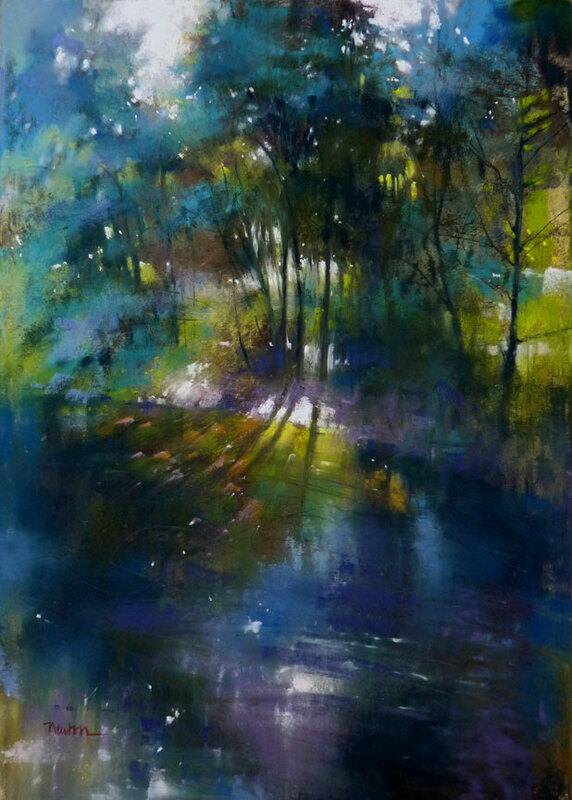 The shafts of light coming through the trees give it a hazy, mysterious feeling. This 5 x 7 is a study for a larger painting. 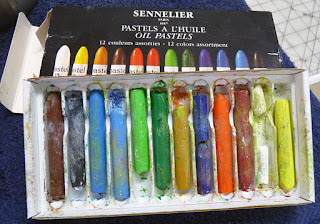 I am soooo tempted to try it in oil! 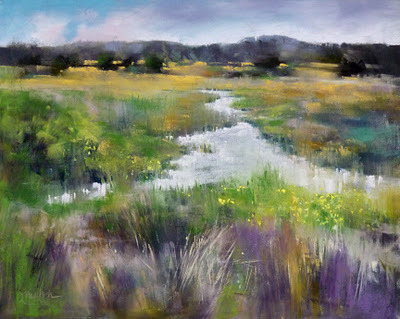 What better time to paint a rainy Pacific Northwest spring scene than a few days after Thanksgiving? 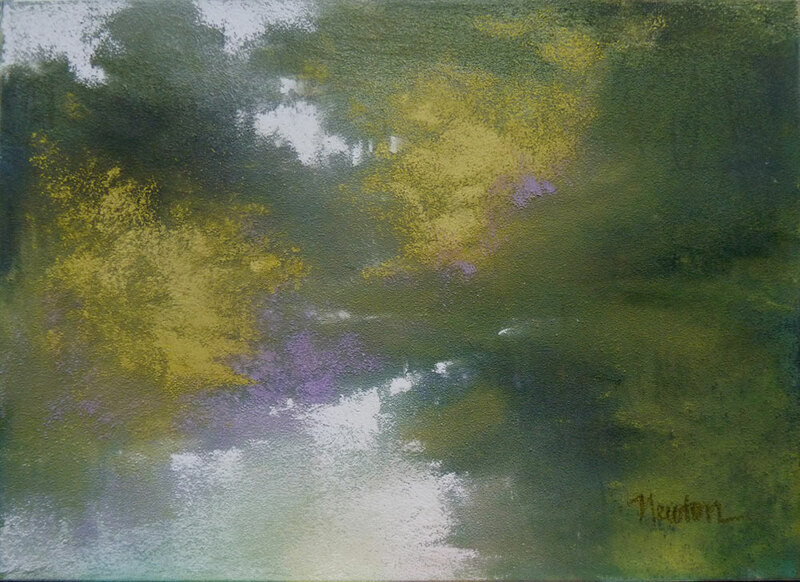 Another 5 x 7 inch painting for my Daily Paintworks Gallery. 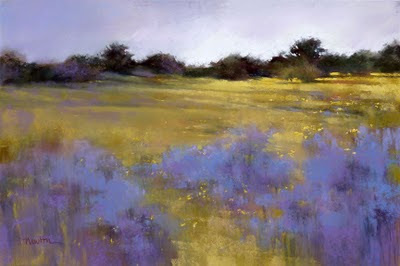 Still finding my way around the Daily Paintworks site, today's 5 x 7 inch painting for sale there is "Lavender Sky." Good news today! I have been elected a Signature Member of the Pastel Society of America (PSA). Yay! 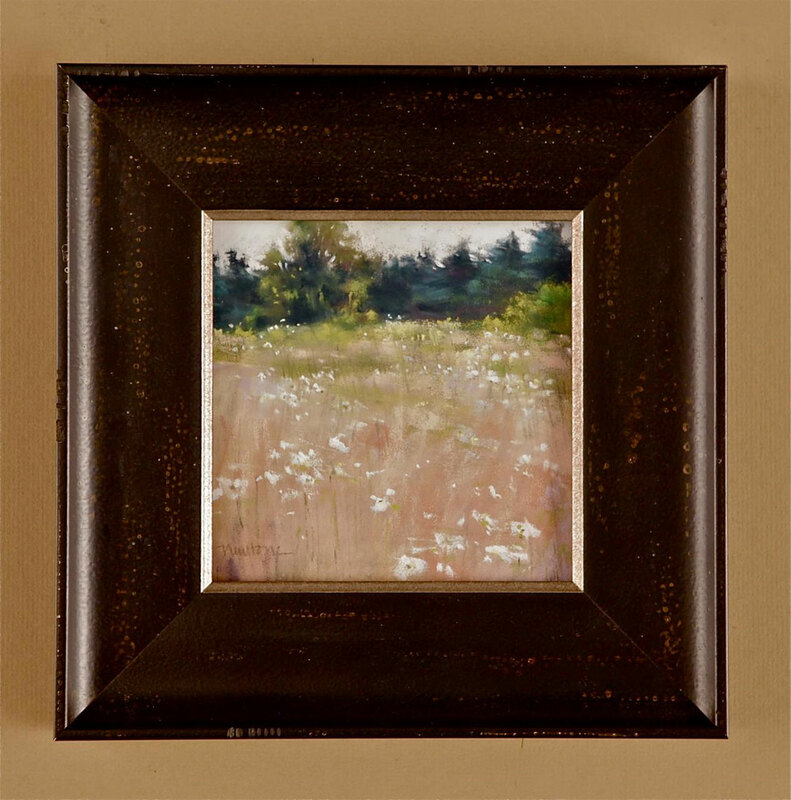 Today's Daily Paintworks painting is 5 x 7 inch "Remembrance." 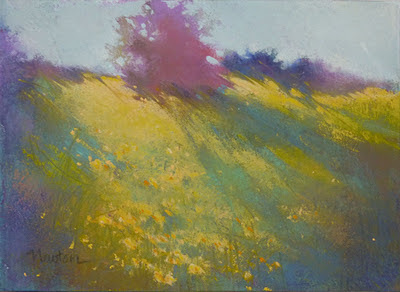 Today's 5 x 7 inch painting for my Daily Paintworks Gallery is an abstracted view of a bright yellow meadow. This painting is about color, the details are for the viewer to imagine. 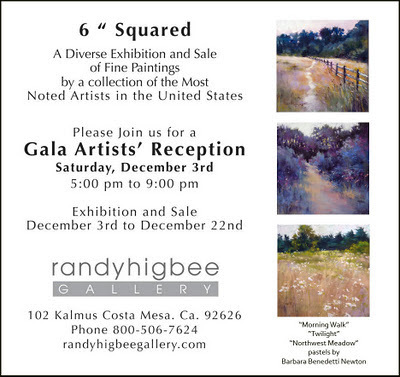 I'm happy to be included in the Fall 2011 6" Squared Exhibition. 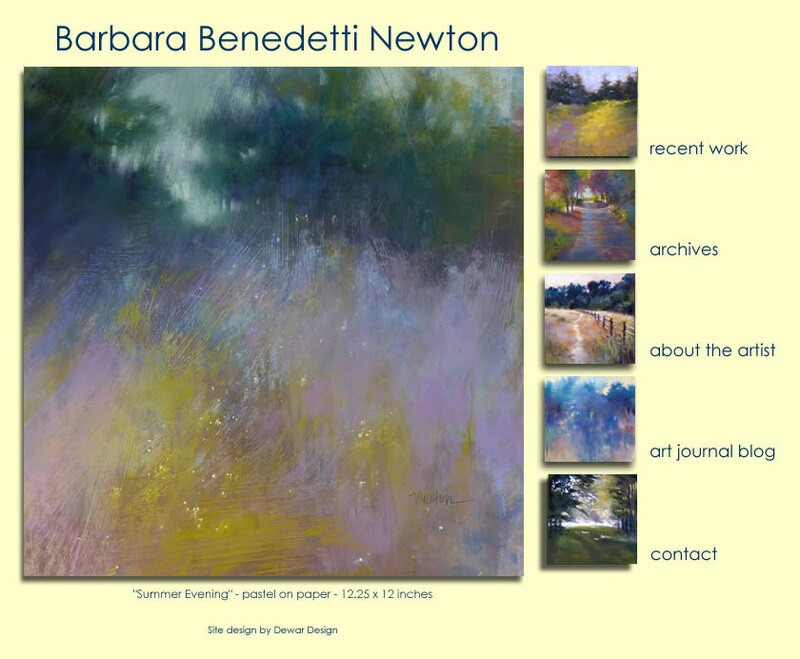 Here is the information and my three paintings. 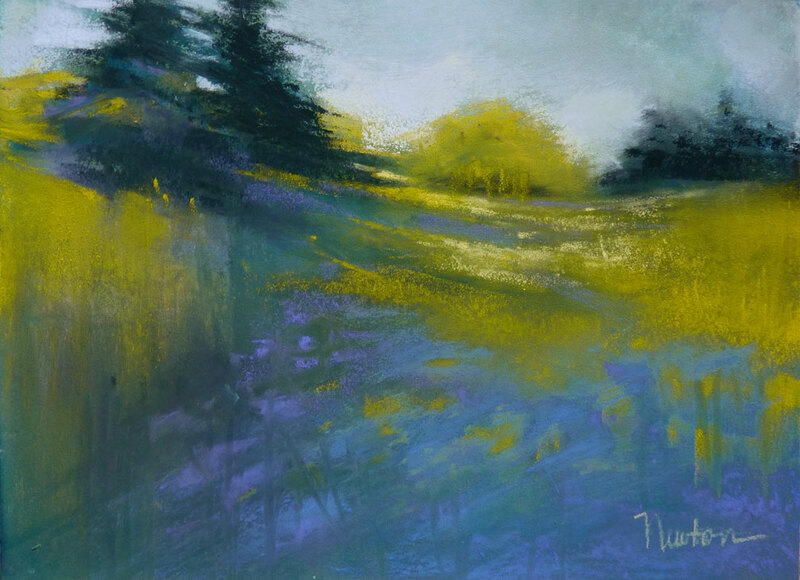 Today's 5 x 7 pastel for my Daily Paintworks Gallery is "Northwest Passage." 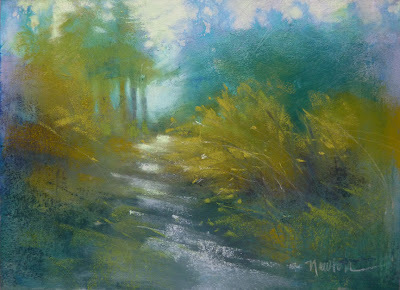 Today's 5 x 7 inch painting for Daily Paintworks is "Woodland Path." 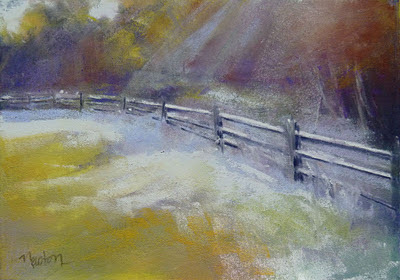 Puppy Annie was entertained by the lawnmower and leaf blower outside today so I was able to paint all day for a change. The Long Way Home, another 5x7 painting for my Daily Paintworks Gallery was an all day project. I had to paint three other 5x7 paintings (to be washed off in the morning) to get warmed up for this one. I have finally posted a couple small paintings for sale at Daily Paintworks! These are 5 x 7 inches, pastel on Ampersand® panels, unframed. I take every effort to establish a true representation of the artwork with my digital camera but colors may vary slightly between the actual painting and the image on your screen due to our (yours and mine) computer displays. Please visit my Daily Paintworks Gallery. 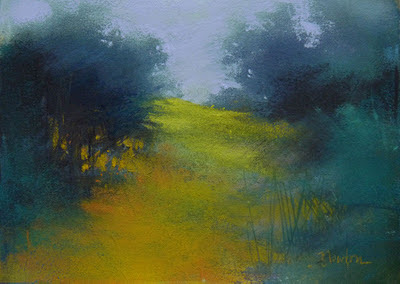 I plan to add many more small paintings for sale soon. Another scene from Mt. Vernon, Washington reference photos taken in September. 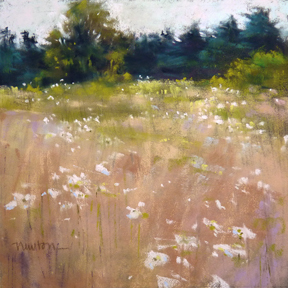 This one is called "Queen Anne's Lace" for the white flowers along the path. I finally figured out a way to keep the pastel dust off of my computer while I view the reference photo on the screen. I set the laptop on a chair, set the chair on my worktable next to my easel. On the left of the easel is an air filter that (hopefully) is sucking the dust in as I work. 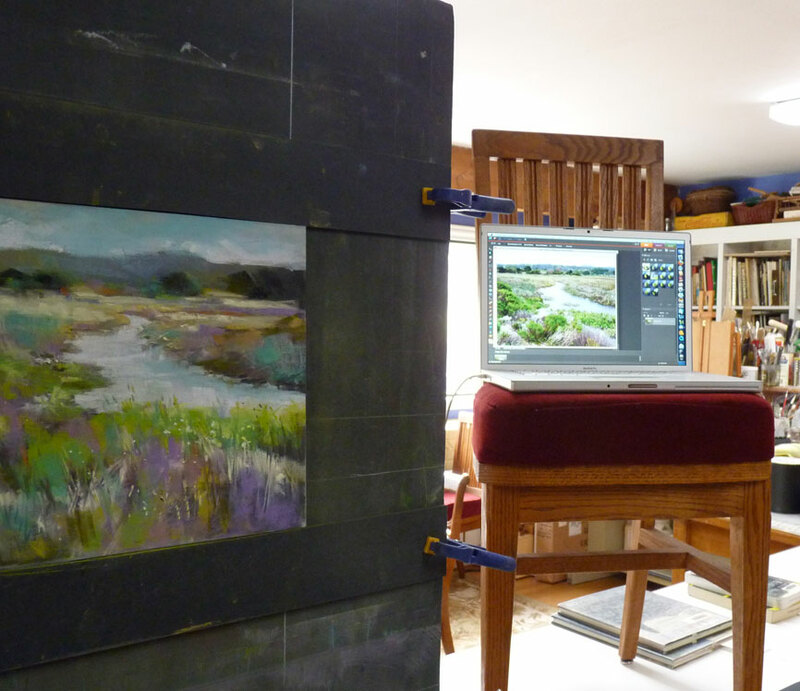 The painting on the easel is a beach scene of the Carmel river painted in the Spring of 2010. I unframed it and reworked 95% of it today. See the new "Carmel" below, 11 x 14 inches on Ampersand™ pastelbord. With another birthday approaching, it occurred to me to review all the paintings in my studio and divide them into two categories: those I am proud to leave to my heirs and those that might end up in a garage sale (with my name on them). So, I'm beginning the process of getting rid of the mediocre work...one way or another. First up is a little 9x12 to be reworked into something better. I brushed off the pastel, turned the paper upside down, and after about an hour the top part looked good to me but the rest just wasn't coming together. I sent the image by email to several members of an artist's critique group I belong to and asked for 'a little help from my friends.' With good feedback from them, I was able to resolve the foreground and I'm now happy with the painting. They each suggested more work on the foreground. I brushed off all pastel except the top 1/3 of the painting and reworked the rest. 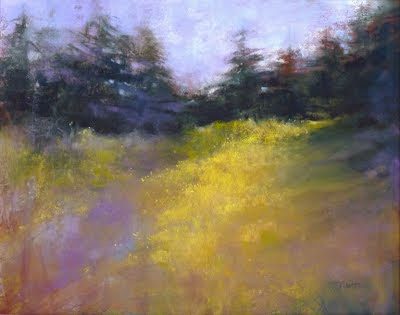 Here is the completed painting, "Meadow Lights." I thought it would be fun to show you the work of three of the artists who gave me feedback. 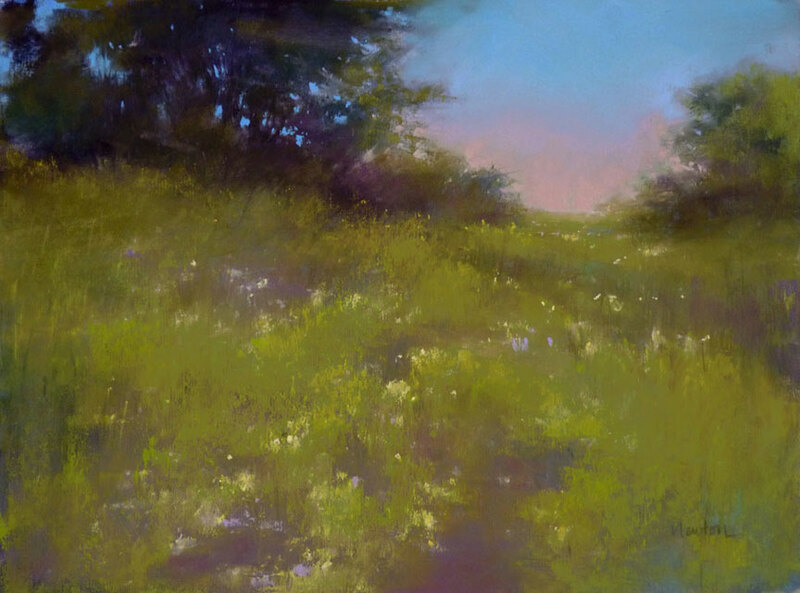 Another little 6 x 6 inch painting, this one is called "Northwest Meadow" and is from an old reference photo I came across on my laptop. I set the computer near my easel and painted from the screen image instead of a photo print-out. I'm painting these little paintings on charcoal color Pastelmat. Click on the image to enlarge. 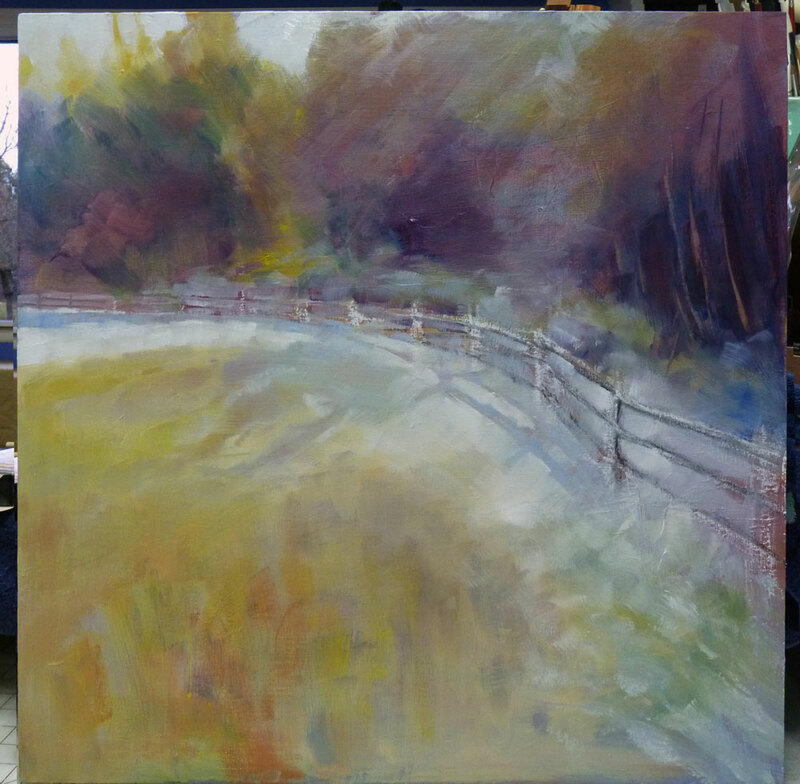 Another 6 x 6 inch study of the dog park. 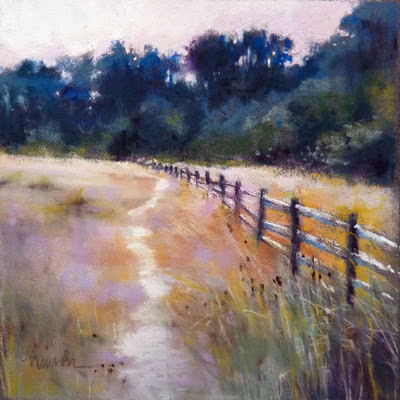 The reference photo was taken at the end of summer when grasses and seed pods were dry and still had some color. Now all is gray and soggy. 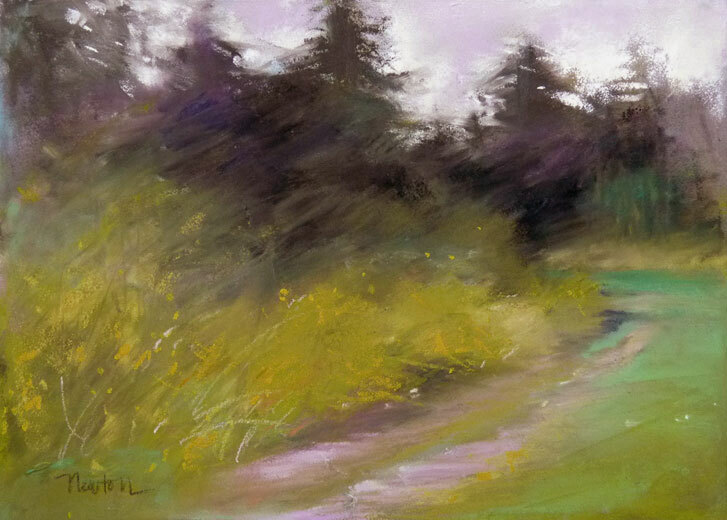 Here's the dog-park path again, this time much smaller ( 6 x 6 inches) and painted in a different palette. Click on the image to enlarge. Another scene from my daily outing with Annie. This path or byway runs parallel to the off-leash dog park fence. 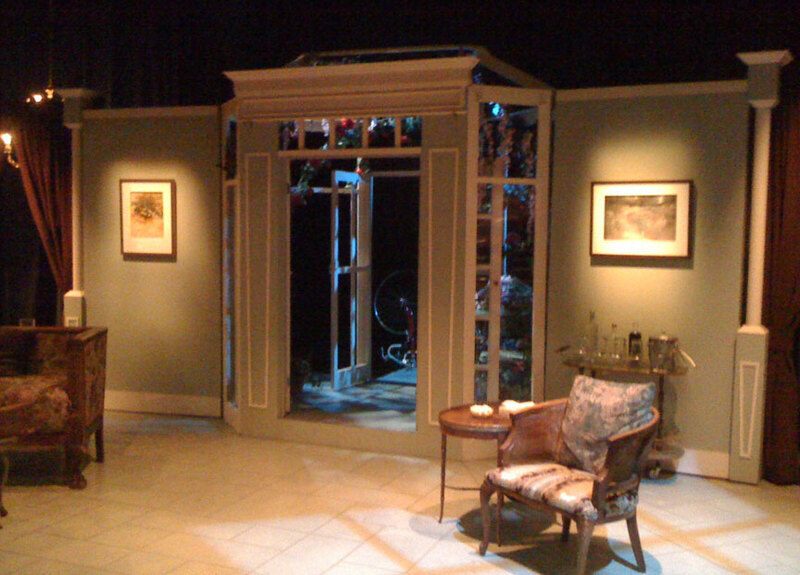 I am pleased to have two of my paintings included in the set for the production of Amy's View at the ArtsWest Playhouse in West Seattle, Washington. We saw the performance last night and it was an interesting experience to have my work referred to in the script as having been painted by one of the characters in the story. 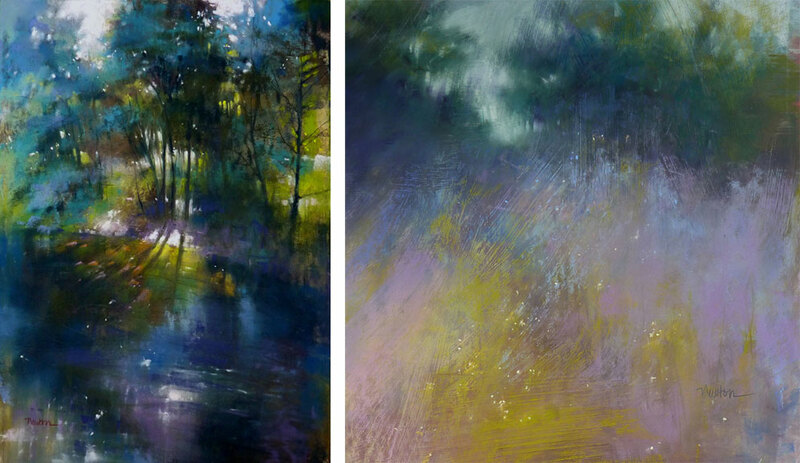 Some paintings practically paint themselves - and some definitely do not! 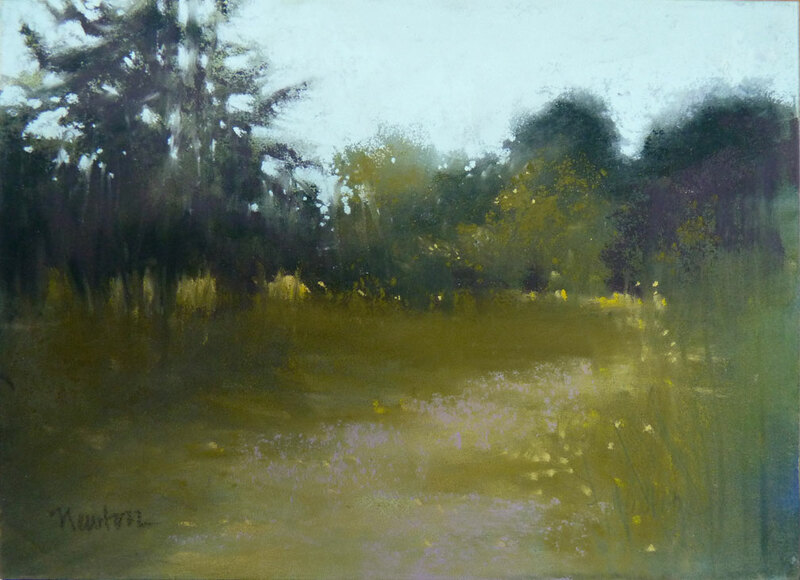 This seemingly simple subject and composition began as a plein air sketch at the Elizabeth Mowry workshop a couple weeks ago. 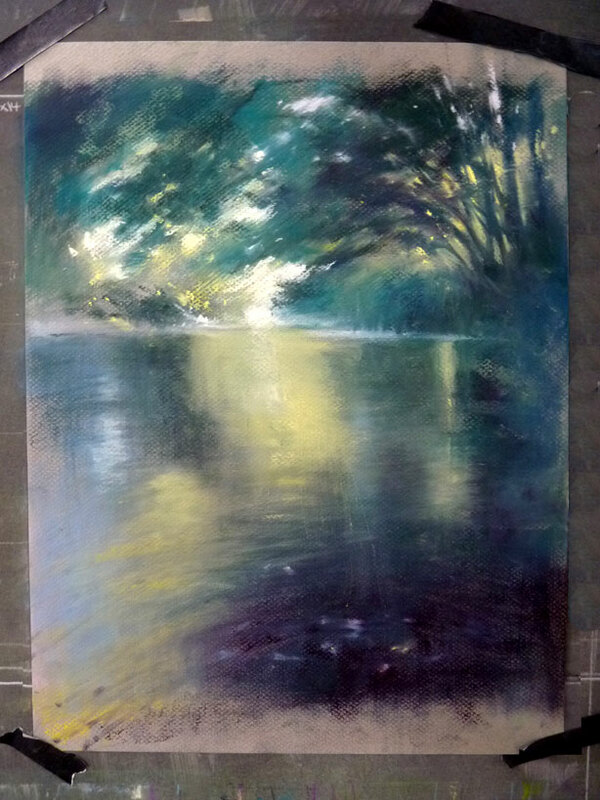 Back in the studio, I thought I could finish it quickly but the challenge was in the lighting. I declared it done and photographed it (twice!) 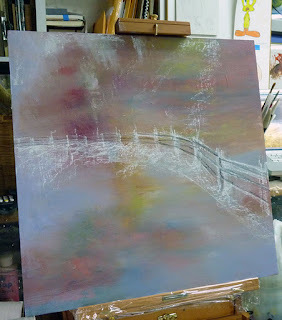 but I still had a nagging feeling about it so it went back onto my easel. I'm happy with it now to tell the story of the approaching storm that summery day, and of the change of seasons. This view of the Cedar River from the walk-across bridge is now part of my weekday walk with Annie because it is how we get to the off-leash dog park. We started Home Obedience classes last night so today's walk was slower - not so much pulling. We are learning. And as I mentioned in my last post, thanks to Elizabeth Mowry, I am looking around with new eyes and I see several dog-park scenes for future paintings. I have owned Elizabeth Mowry's books for years, reading bits and pieces here and there; always pleased to revisit images of her art but more importantly for me, to read her words of wisdom. 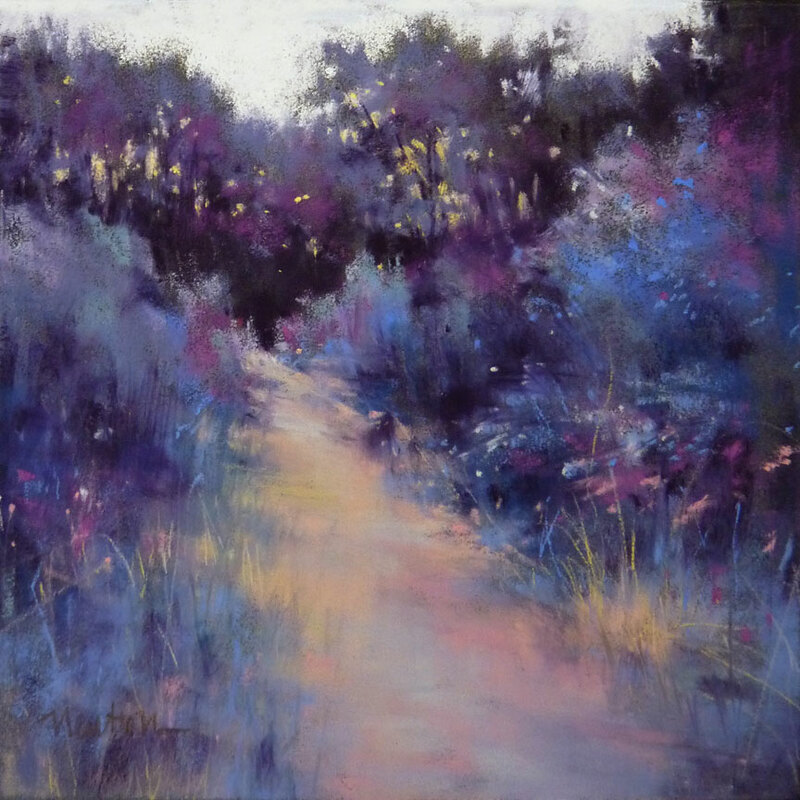 In my limited experience with pastel artists who also teach, I am so pleased when their attitude matches the beauty of their art. Last weekend I had the good fortune to take her workshop. 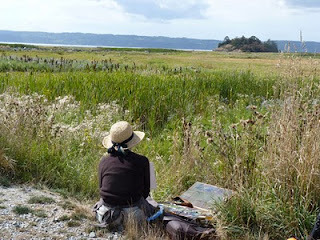 Elizabeth's kind, gentle nature enabled me to be my best-self painter for a few days. 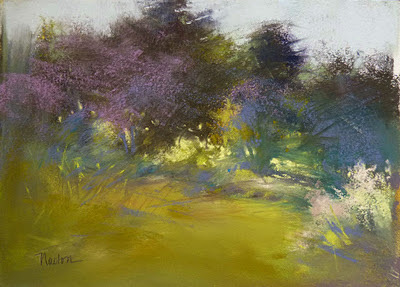 I slowed down, became more thoughtful and took more care in selection of my colors and strokes. Even as I stood at my own easel, hearing her voice as she worked with others in the group of very creative artists kept me on track. Back home, I am looking at trees, bushes, and skies with new eyes and as I paint, I am inspired by Elizabeth's serenity and focus. I think I have pushed this painting as far as I can without losing my vision for it. Funny (well, NOT funny) how quickly a painting can turn to ... where are all those crazy symbols? I've had a week of hot weather, beans and cucumbers galore, almost constant watering of the gardens and visits to the dog park every day with puppy Annie. But, I've also managed to get three paintings done by not cleaning house or making dinner. Click the image to enlarge. A textured gesso surface can help tell your story (click image to enlarge). 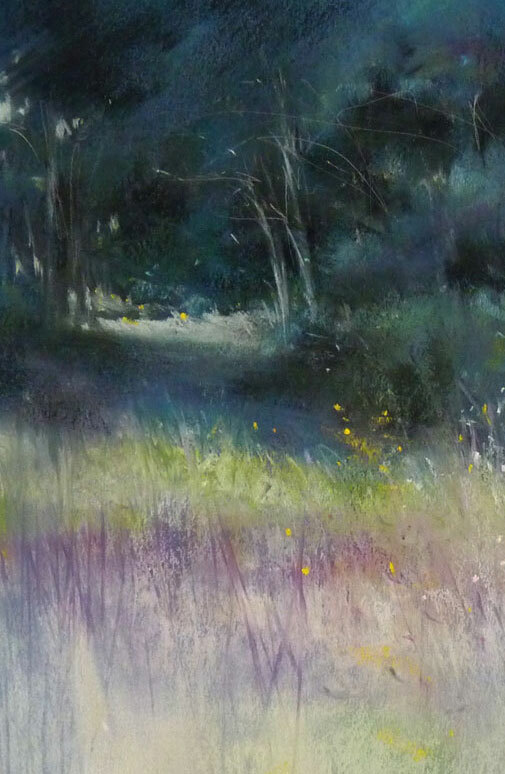 This is a detail slice of "Summer Evening." 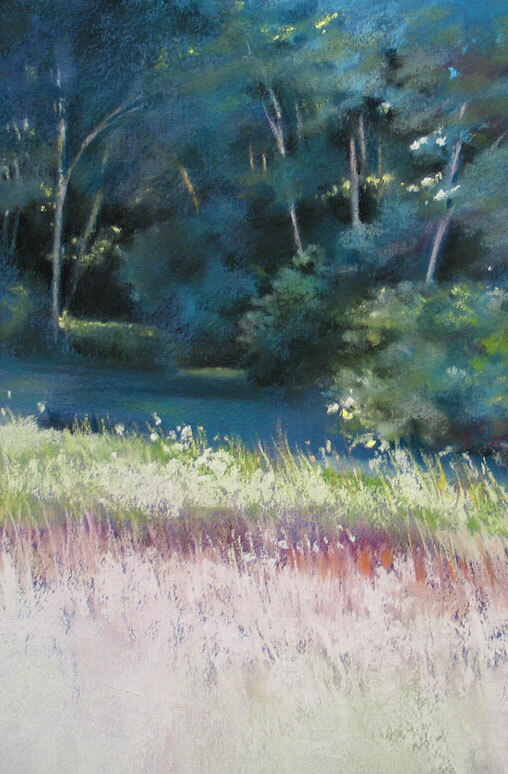 To see the entire painting, CLICK HERE. Today I unframed a piece that was painted six years ago - almost to the day. Looking at all those roundish, controlled strokes I couldn't resist a little rework. The detail at the left is the old painting, the detail below is the rework. 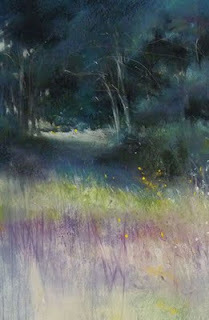 I am pleased to see that my stroke has become more spontaneous and that I have managed a more subtle story of the scene. 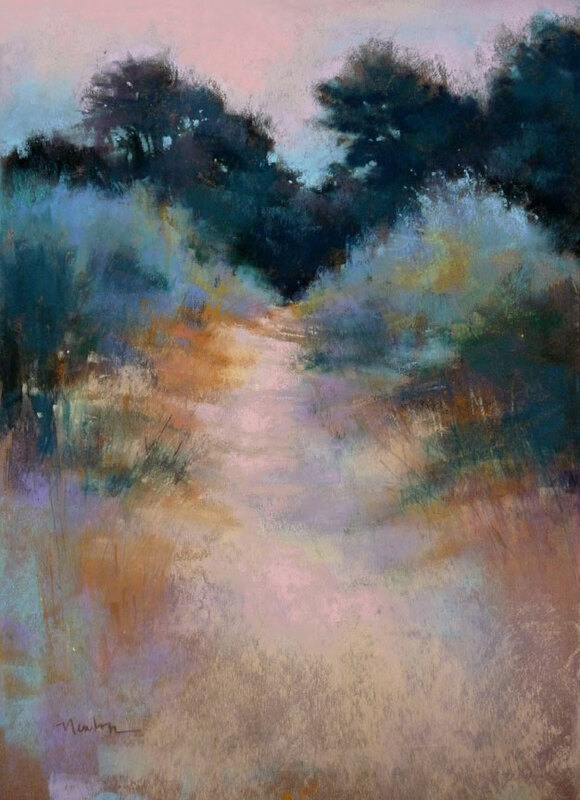 To see the entire reworked painting, "Daily Grace II", CLICK HERE. The August Editorial about framing pastels has been posted. 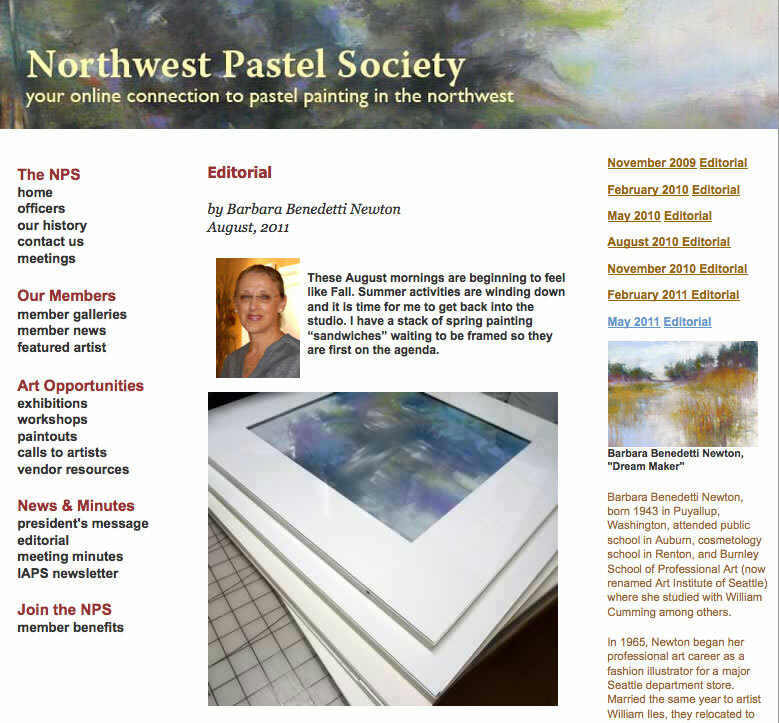 To read the editorial, CLICK HERE to go to the Northwest Pastel Society homepage then select "editorial" under "News & Minutes" in the left hand column. Early one evening over the hot weekend we took a refreshing walk in the shallow part of the Cedar River near our home. Lazy-summer memories of swimming in the Green River as a child came back to me. A magical time involving all the senses. 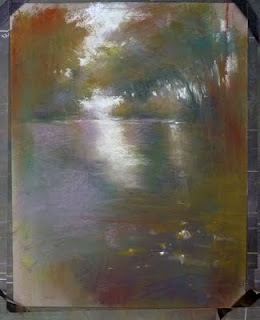 Back in the studio I wanted a pastel sketch of the river scene in preparation for a larger painting. For me to paint a scene more than once, there has to be some additional challenge or experiment involved or I quickly become bored. 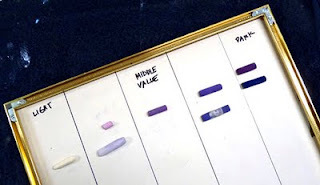 This time I focused on value as I mindfully selected colors based on value first and color second. To help me stay on track, I inserted a piece of slick, non-archival foam core into an unused metal frame and divided it into five values. Then, as I selected and used pastels, I placed them in their appropriate slot on the value palette. 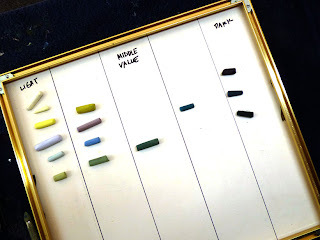 Working this way instead of intuitively picking up many many pastels to see which ones work limits the number of pastels I use. I don't know if that is good or bad but I do know it is fewer pastels to clean and put away when the painting is complete and the slick foam core cleans up with a damp wipe.